I have this habit. Every Saturday throughout the spring, summer, and fall I buy fresh flowers at my local grocer or farmer’s market. It’s one of my favorite things, and a splurge that I get so much enjoyment from. 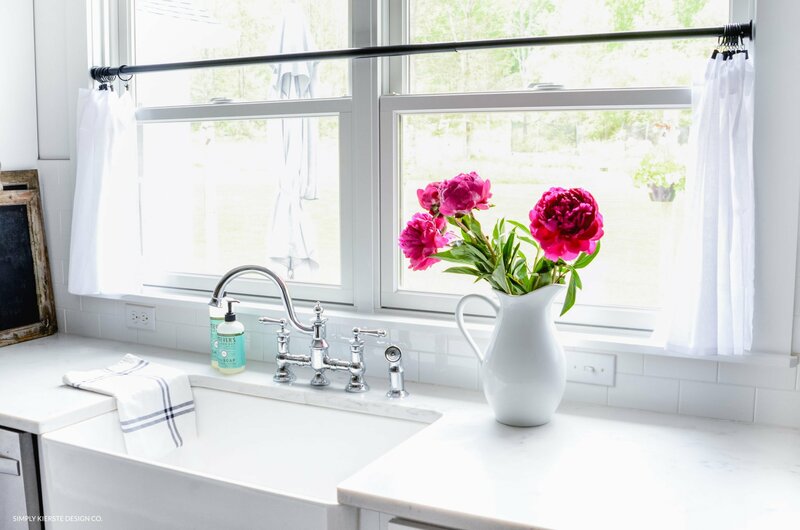 Tulips are my go-to in the spring, and when summer hits, peonies are always beckoning my name. I simply couldn’t resist these vivid, summer pink peonies when I saw them, and they brightened up my home for nearly two weeks! 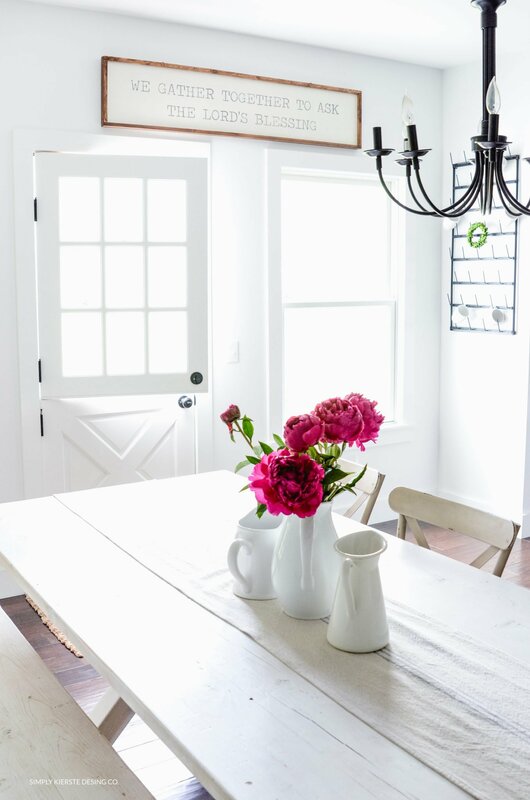 It was really the case of the traveling peonies…they made their way through the kitchen and dining room several times over the course of those two weeks, and I loved seeing them in all the different light. 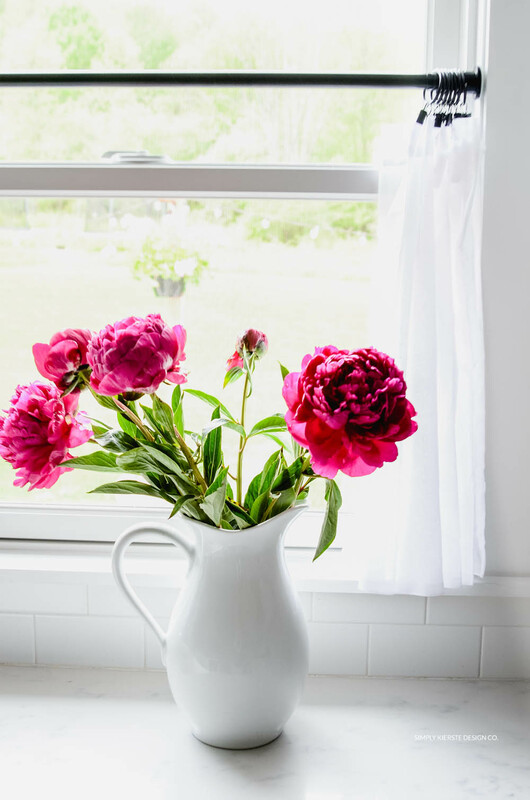 If you’re looking for a way to add a little color and summer charm to your home, pink peonies — or any fresh flowers — will do the trick! It’s my secret to brightening up our home, and making it homey and cozy. I also recently put up white linen curtains at my kitchen windows, and I’m in love. The windows face our back property and a gorgeous wooded view, so I usually prefer to have no curtains (our family room doesn’t have them either), but they became necessary. The kitchen windows also face the west, so as the sun goes down each day, it shines directly into the kitchen. During the winter I love it, but during the summer months it’s way too hot and bright. So…kitchen curtains became the answer. I chose a white muslin for several reasons. They’re sheer enough to let plenty of light through, but also block the blinding brightness and diffuse the light beautifully. They blend in with my walls and kitchen. And…they’re white. Which I adore. They really are perfection, and I’m so happy with them! I didn’t want them taking up much window room, because I love my view so much, so I bought the panels to fit my windows almost exactly, so there wouldn’t be a lot of bulk. The other great thing about muslin is that it isn’t bulky, and they fit nicely on each side of the window without taking up too much room. Gorgeous. 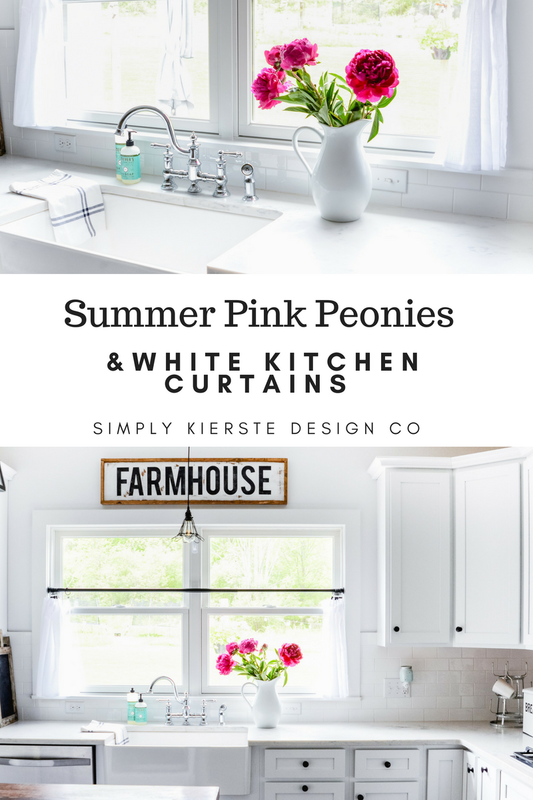 Summer Pink Peonies & White Kitchen Curtains. Affiliate links are included below. If you click on a link and make a purchase, I will receive a small commission at no extra cost to you. Please find my full disclosure here. 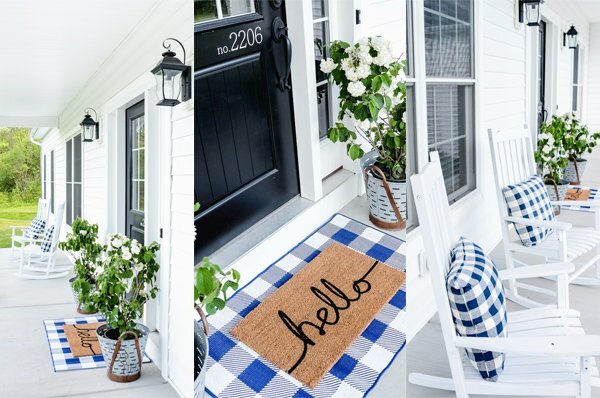 Subscribe to Simply Kierste Design Co. for TONS of ideas for farmhouse style, holidays, DIY, organization, recipes , and more, delivered right into your inbox! Hi Kierste! I am absolutely in love with your site, and your home! It is sooo incredibly beautiful, and peaceful. Anyway, your white muslin curtain link appears to be broken. Can you please fix, or let me know where to purchase these beautiful curtains? Thank you so very much! Blessings!! Could you point us in the right direction? Thanks! !